I realize that a lot of content we post about the RS gets left out of the forums and wanted to address this as I think it's a great medium for retaining and searching information as well as discussion. This thread will contain updates, information, posts and news and if we need to break out topics from here we will. Madokami, Paolo, sublime1996525 and 6 others like this. 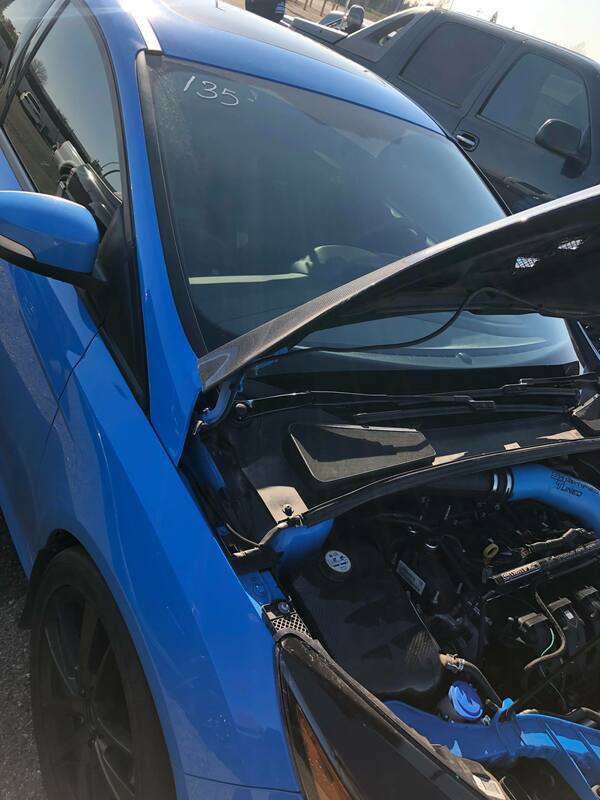 Congratulation to Jorge for running [email protected] in his Focus RS. This is no small feat making him the second fastest RS we know of so far. The other reason this is not small feat is because a lot of the fast RS cars (drag racing) have done it on the stock turbo. The stock turbo is a great unit but we are finally starting to see the larger turbochargers step out of the shadows of the OEM turbo (which is what we should see). The key here is that the fuel system is almost at the limit with the stock turbo and torque can be over 400 ftlb. This car has aux fuel and a built bottom end meaning the limitation is lifted in bot respects. Accomplished on a built bottom end with stock head, PTE turbo, 4 port aux fuel, E30 and with a Stratified Tune. The PTE drop in turbo is starting to shine with the addition of the Aux Fuel and E30 even on the stock head (trapping around 5mph faster than an OEM Turbo). The setup is far from being maxed out yet as a GA and upgraded TIP sensors are on their way to Jorge so we can read higher boost pressures and turn up the boost. 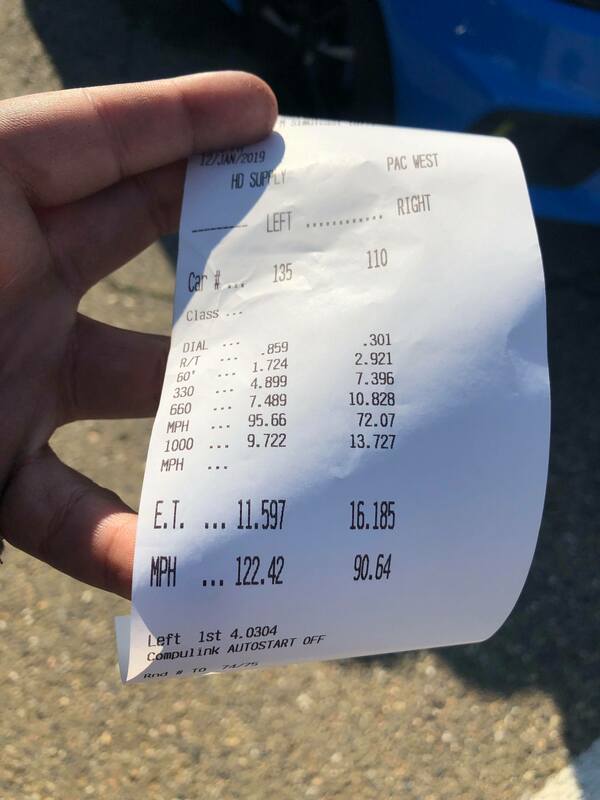 I am sure we will see more from him and for now a big congrats on getting the motor built (Mafia Motor Worx) and laying down a very solid time!! MorningZ, Vinnie13 and fbaltona like this. Great to read your findings as always. Have you had a chance to test the mountune sequential gearbox? Have not tested this yes - it's a pretty cool box to be honest and I think we will see it in more cars as these cars age and get built. Cheers Dean, glad you're enjoying the tune! I think I have seen you! Drop by sometime! The ST is honestly very well sorted and has all our goodies on it. Have only had it around Mission but around the 375whp mark it is in a balanced place and can do quite well. Come by and have a look. Paolo and seniorgeek like this. I'm stratified tuned also. Would love to be modding my car is USA. So many knowledgeable people out there and prices are great. Here in Melbourne everything is so expensive and limited to who can do these mods. I was very new to the ecoboost platform so I was trying to learn as much about it as I can. I can honestly say that about 80% of what I know now I got from reading the stratified tech articles. I already had a Mountune tune since they were the "big name" but I felt like I owed it to Alex to give them a try. I have been very happy with my 91/E30 combo flash tune ever since. Have had 0 issues with it for the last 10k mi and 6 trackdays. Quick question though: I've started to notice that my "pops & burbles" have been less and less, even on sport mode. I definitely here it at the track (in track mode) but I do miss hearing it while I'm doing a canyon run. I remember I would even get a pop or two even when I was in normal mode back when I just flashed. Should I just reflash?